Four months after winning their first Kelly Cup championship, the Cincinnati Cyclones are back to work. Because of all the success the Cyclones enjoyed under coach Chuck Weber in 2007-08, only 7 players are returning in the quest for a repeat. David Desharnais, the league's Most Valuable Player last season, has earned a well-deserved promotion to the American Hockey League. Clearly, the Cyclones have their work cut out for them if they plan on even coming close to the 71 wins they recorded last campaign between the regular season and the Kelly Cup Playoffs. Cincinnati will play the first two games of its season on the road, beginning tonight in Wheeling. "It's coming along," Weber told NHL.com. "It's definitely a work in progress. We're excited to finally get going here. It was nice to have the short summer, but we're looking forward to getting going on the road in Wheeling." It certainly will be an opportunity for Weber to gauge what he has this time around. With several key players from last season's championship squad out of the picture, Weber will find out if his new, young players will be as hungry as the ones he had in 2007-08. He'll also find out if it's even possible to replace the 106 points Desharnais put up last season. "I don't think there's going to be one person that can pick up that offense," Weber said. "I think you've got to spread that out amongst your group. I think we have some pretty talented forwards. It's going to come down to all of them meshing together for us to have similar success. It's going to be tough to repeat 71 wins like we did last year, between the regular season and the playoffs. But we're looking forward to getting off to a good start." Desharnais is off to a nice start with AHL's Hamilton Bulldogs, as he leads the club with three points (1 goal, 2 assists) in 2 games. He's just another prime example that the ECHL has players who are more than capable of playing at the next level. Desharnais was also one of the Montreal Canadiens' final cuts. "He's gotten off to a great start in Hamilton," Desharnais said. "We always knew that David had that capability. It's just one of those situations to get played in an offensive role, and it's happened so far. He's grabbed it and taken advantage of it." Several other players from last season's roster have also taken advantage of their opportunities, evidenced by the 7 returnees in Cincinnati. As recently as a few weeks ago, Weber was planning on more than seven, but that's a testament to the amount of talent the Cyclones had in 2007-08. "I was hoping for a couple more, but it's good for them," Weber said. "They stuck in the American League. Off last year's 23-man playoff roster, we had 11 guys go to NHL camps and 19 go to American League camps. From that standpoint, they always say that with winning comes individual success. It's worked out for a lot of our guys off last year's team." If there's a positive in this, it's the fact that a championship hangover probably isn't in the cards for the Cyclones. With so few players coming back, Weber is once again coaching a young, hungry squad. "We only have seven guys returning," Weber said. "There're a lot of guys that haven't won before that want to kind of take that success. The big thing was this summer, I was fortunate enough to pick Bob Gainey's brain a little bit with all the success that he had in Montreal, winning back-to-back championships. It's a little different situation here, but it's trying to get the older guys and the new guys to connect. We need to be able to take some of the lessons learned from last year while at the same time, not dwelling on last year's success. So many of these guys didn't go through those battles. We just have to blend together as quickly as possible." They'll have somewhat of an opportunity to do that with bus rides to Wheeling and Dayton this weekend. Weber, who is against starting the season on home ice, wouldn't have been opposed to an even longer road trip to kick off the new campaign. "I always prefer to start on the road," Weber said. "I would have actually rather gone on the road overnight, just to give the guys some time together. But it gives us a chance to get our feet underneath us before the opening-night festivities at home. It's going to be pretty special for everybody." The festivities will take place at U.S. Bank Arena on Oct. 25 prior to their first home game against the Bombers. 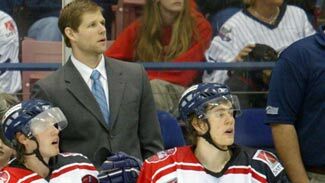 While this is Weber's second championship as a coach -- he was an assistant when the Orlando Solar Bears captured the International Hockey League's crown in 2001, next Saturday will mark his first banner-raising experience. "It's going to be a pretty special night," Weber said. "This will be my first banner ceremony. We won the championship in Orlando, but the IHL folded so we never had a chance to hoist a banner or anything like that. It'll be pretty special to see that go up." Weber said ticket sales have once again been solid. Certainly, it helps that the Reds and Bengals have stumbled in recent seasons. "There's been a little bit of buzz that's been created," Weber said. "It's fortunate for us with the success that we've had, and it's unfortunate with some of the lack of success some of the other teams have had in our market. You never wish any ill will on anybody, but hopefully we can parlay our success from last year into bringing out sports fans to our games." Around the ECHL -- The season gets under way tonight with seven games, followed by another 11 Saturday. … The Idaho Steelheads named Marty Flichel captain this week, while Wes Goldie got the job with the Victoria Salmon Kings. … The Mississippi Sea Wolves have joined forces with the Philadelphia Flyers. … The Phoenix Roadrunners acquired All-Star goalie Craig Kowalski in exchange for forward Bryan Esner.